Lixuria passenger and car ferry ticket prices, timetables, ticket reservations and information for ferries sailing from Lixuria to Killini. Compare all available Lixuria ferry ticket prices in real time and book the cheapest available Lixuria car and passenger ferry tickets sailing to and from Lixuria, Killini with Ionian Ferry Line ferries online with instant confirmation. Book Lixuria (Kefalonia) Ferry Tickets with Ionian Ferry Line for ferries sailing from Lixuria to Killini online in advance to enjoy the cheapest available ferry ticket price. The price you see is the price you pay. There are no hidden extras or surprises such as added fuel surcharges or booking fees and we do not charge you anything extra for paying with a Visa Electron card. The price we quote you for your selected Lixuria passenger or car ferry ticket, onboard accommodation and vehicle type is all you will pay, and that's a promise. To obtain a Lixuria ferry ticket price and book your ferry ticket securely online please use the real time ferry booking form on the left. You are also able to add a hotel at your destination, or anywhere else, to your ferry ticket when completing your ferry ticket reservation. Kefalonia is one of the most popular destinations of the Ionian Islands and the biggest island of the group located between Lefkada and Zakynthos. Kefalonia is located on the West coast of Greece, and has a mild climate along with excellent beaches. This Greek Island has many wonderful beaches with fine sand and turquoise, bleach-like, waters specific to the island. Others of its many beauties are its picturesque villages, its National Park on its highest mountain (Mount Ainos) on which a rare specie of fir forest grows and terrific landscapes. This section has everything about the island. Kefalonia is a large island with diverse and dramatic scenery. The island has many wonderful bays and inlets which help to form its unusual shape. The northern rocky coastline has small and clean, pebble beaches whilst those on the southern shores are long and sandy. Kefalonia is just waiting to be explored and with a good road network the island is ideal for driving. For those who prefer a slower pace, Kefalonia is a great island for walking, cycling and horse-riding. With the Greek islands of Lefkas, Zante and Ithaca close by, you can take a ferry, motor-boat, or yacht to explore the Ionian shores. Or maybe you just want to unwind? Kefalonia’s stunning beaches await. Kefalonia is the largest of the Ionian islands and dramatically different from the rest. Once voted 10th in a world scenic beauty league, Kefalonia boasts some of the best beaches of the Greek islands. It's an island to be explored. First on the list must be the Kefalonia Caves. The caves have stayed cool over the thousands of years it has taken to form the multi-coloured stalactites and stalagmites that fill the caverns. Kefalonia is more mountainous than any other Ionian island with Mount Ainos in the south with its tallest peak - Megalos Soros - which reaches up to 1626 metres. Mount Ainos is covered by a very rare species of fir tree (Abies Cephalonensis). Read more in the Kefalonia Flora and Fauna section. Kefalonia has many wonderful bays and inlets to form its unusual shape and the rocky coastline has small and clean, pebble and sandy beaches. On the north-east coast of the island lies Myrtos Bay with its stunning white sand and pebble beach and incredibly deep aquamarine sea. From here the village of Assos is visible - a tiny hamlet nestling at the base of a peninsula crowned by an imposing Venetian fortress. Further north the village of Fiscardo retains its Venetian style with a pretty harbour lined with fishing caiques, luxury yachts and daily cruisers. The south coast boasts some more wonderful beaches favoured by marine turtles which are closely monitored by a local turtle protection group. There are so many different ways of spelling Kefalonia: Cephalonia, Cephallonia, Kefallonia, Kefallinia. Some believe that the island of Kefalonia was named after the mythological figure Cephalus while others say it is derived from the Greek work for head,'kephalos' as the island is the biggest of the Ionians and is thier natural head or leader. Many local families of Kefalonia have surnames ending in "atos" and almost every community in Kefalonia has a name ending in "ata"
Best Price Guarantee - We always offer you our lowest available Ionian Ferry Line passenger and car ferries ticket price to and from Lixuria. There are no hidden extras or surprises such as added fuel surcharges or booking fees and we also we do not charge you anything extra for paying with a Visa Electron card. The price we quote for your selected Lixuria ferry ticket, onboard accommodation and vehicle type is all you will pay, and that's a promise! In the unlikely event you find the same all inclusive Lixuria ferry ticket cheaper in the brochure of any other tour operator we promise that we will do our best to beat that price or offer you the choice of requesting a refund. 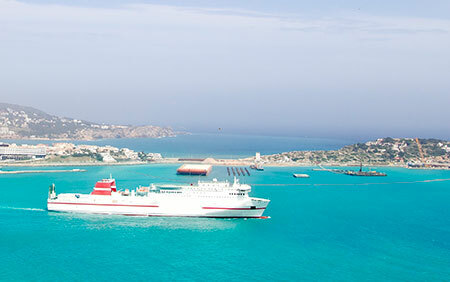 To book Lixuria car and passenger ferry tickets please click here. At ferryto.com you are able to obtain live Lixuria ferry ticket prices, check availability and book car and passenger ferry tickets to and from Lixuria at our lowest available ticket price. Ferryto.com is part of the world's largest online ferry ticket distribution network providing the ability to book over 80 major European ferry operators including to Lixuria and to over 1,200 other ferry routes throughout the UK, France, Spain, Ireland, Holland, Eastern Europe, the Mediterranean, the Baltic and North Africa.